"Who can forget Favre’s touchdown pass to Andre Rison in Super Bowl XXXI when he immediately took off his helmet and sprinted toward the sideline? Pure elation. Although I was only four years old at the time and don’t remember it happening specifically, that’s still one of my favorite Favre highlights." "Has to be the Monday Night Football game against the Raiders the day after Irv died. 311 passing yards and 4 TDs – all in the first half. The receivers and tight ends catching everything he threw up. One of those games where you remember exactly where you were and who you were with, and you just had that feeling that something special was happening." "I still remember the snapshot of him running in the TD and BARELY placing it on the corner of the end zone in the Superbowl 31. What a play!" "End of the season 2003-2004. Felt like we were the team of destiny. We had the Monday night smashing of the Raiders where Favre set records after his father died. We snuck into the Wild Card game when the Vikes lost on a last-second touchdown by the terrible AZ Cardinals. Al Harris makes Matt Hasselbeck's OT dream of, 'we want the ball and we're gonna score!' come true. 52-yard pick six. And finally the heartbreaking, fist mashing, 4th and 26 against Donovan McNabb and Freddie Mitchell (an otherwise utterly forgettable receiver). Though not strictly a Favre moment, the highs and lows of that season make it my favorite time to be a Packer fan." "Sure there are a lot of them to choose from, but I still go back to 1994 and the last game at County Stadium. Funny how memory works, up until about a year ago, I had convinced myself this game was against the Bears instead of the Falcons. Well, I was politely, but sternly, corrected by a nice old lady. In sum, Packers are down by three with 21 seconds left, ball is on the nine yard line. Plenty of time to throw to the endzone and score. Plenty of time for an incomplete pass stopping the clock for a field goal. Brett Favre, 'Nah, I’m just going to end this right here.' I’m not sure who jimmylegs06 is, but I like his style." "The Raiders game the day after his father died. The initial shock. The speculation whether he’d even play. The nationwide support when he ran onto the field. The explosion of passing offense. The team stepping up like I’ve never seen. The heartwarming walk off the field with Deanna. Sports aside, I’ve never been so glued to the TV." "I was at Lambeau stadium the day he replaced Don Majikowski (injury), the collective group of 65,000 strong were muttering under their breath...will this guy be any good? I think we know how that turned out..."
"I had the privilege of sitting next to Brett Favre's father, during a preseason scrimmage one year at Lambeau. Wow what a treat, a true football family from Kiln, MS. His father was a coaching legend and Brett took his teachings to heart." "Favre against the Raiders on Monday Night Football after his dad died is one of the greatest individual performances of all time, considering the circumstances." "Every time he ran to the end zone after a TD pass and threw DD or another receiver over his shoulder in celebration brought a smile to my face. It was refreshing to see greatness and fun go hand in hand, and made me feel like he could be at the local school with me and my buddies in one of our pickup games." "Watching the Raiders game with my own Dad after Favre lost his father. Magical performance. I was home from college and the timing of that moment could not have been better for my Dad and me to watch it together." "Kind of random but it was a MNF game versus the Jaguars I watched in a bar in Minneapolis amongst Vikings fans. I was proudly decked out in green and gold so the patrons enjoyed giving me crap the entire game. For most of the night, they were reveling in the Packers losing, but Favre slowly chipped away and capped the comeback with a six-yard run with about a minute left. The Vikings fans were stunned and man, did I let them have it." "I was attending game with my best friend from high school—it was Nov. 12, 1995. 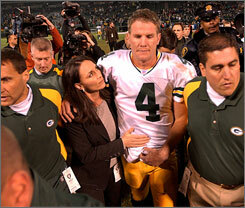 The previous week Favre and the Packers lost at dome in Minnesota and Favre severely sprained his ankle and was knocked out of the game. This was the famous TJ Rubley game. No one knew if Favre was going to start the next game. We got to game and sat in our seats….Bears games are always fun and they were getting ready to announce the starting lineups—this week was the Offense’s turn to be introduced. (Coach Holmgren always switched every other home game introducing D and O starters). Well, Holmgren kept all 3 QBs (less Rubley who was cut that week) in tunnel and when they got to the final announcement (QB usually) the announcer said “and starting at quarterback from Southern Miss…..” after that you could not hear a thing….the roar of the crowd at that moment was so deafening. It was awesome and definitely gave me chills. Favre proceeds to beat the Bears that game (even as a light snow came down) and ending up throwing for over 300 yards and 5 TD passes basically all on one leg. One of my favorites that I was fortunate enough to witness first hand. One of the best NFL games I have even been to because of the buzz and energy in the stadium after the starting lineup were announced and to beat the rival Bears was just an overall great game. Packers 35—Bears 28." "Not an individual memory, but more like a collective appreciation of his time in GB. Was fortunate that Favre took over essentially as my youth began, and got absolute enjoyment just from seeing him have fun out there. Can still remember playing catch after games and mimicking the announcer as we played, saying, 'Favre to Sharpe!'" your post reminded me that i bought a frozen pizza @ sentry last niht and forgot it on the fronnt porch.. do you tihnk I can still eat it/? or do you think a packer at it L.O.L. I live in Oklahoma, thanks. Ronnie, if you lived in a colder climate, the pizza may have retained its properties due to the natural refrigeration of the night air. However, the overnight temperatures in Oklahoma recently have been in the upper 70s, so I would not advise to eat it. Also, I would be surprised if a Packer had at it in any way, shape or form. Their dietary restrictions would likely prohibit that any way. PS. In today's uncertain economic times, I believe gold to be a reasonable addition to one's retirement portfolio. Please note I am not a financial advisor.